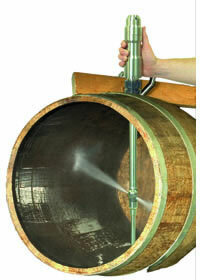 Eliminate the time-consuming and labor-intensive task of moving and rotating your barrels and drums for cleaning and draining with the EvacuBlast or Gamavac barrel and drum cleaning systems. The systems work with the GJ DB, which incorporates an extraction wand engineered into the cleaning machine. However, in order to use this machines you need a vacuum system and a pressure washer which operates at 3.5 to 5.5 gpm (13 to 23 lpm). The Gamavac and EvacuBlast are all in one systems to meet these requirements. Wash Cycle Time: 2-4 min.